Winner of 5 races from 9 starts from 3 to 5 years. Won - Follow@Bet Victor Racing on Twitter Maiden Stakes, Kempton (1 mile). Won - Dubai Duty Free Millennium Millionaire Handicap, Newbury (1 mile 2 Furlongs). Won - 888Sport Stakes, York (1 mile 2 1/2 Furlongs). 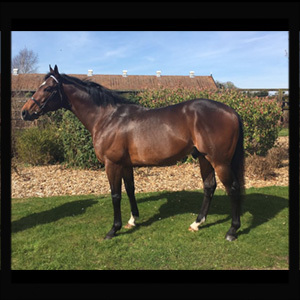 Won - Wolferton Handicap (Listed) Royal Ascot (1 mile 2 Furlongs). Won - Weatherbys General Stud Book Earl of Sefton Stakes (Group 3) beating Air Pilot, Tullius etc. Also a close 5th in the Strensall Stakes, York Group 3 to Mondaliste, Mutakayyef, Based and Top Notch Tonto. By leading Sire Dansili, Sire of successful stallions: Rail Link, Zoffany, Bated Breath etc. Out of Mooakada, by Montjeu. 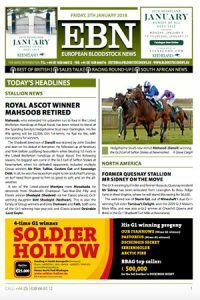 Montjeu Sire of leading sires Authorised, Camelot, Scorpion, Pour Moi, Walk in the Park etc. 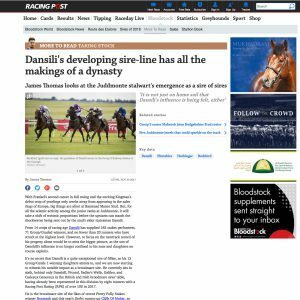 Nov 2017: Racing Post - James Thomas' article on Dansili's growing dynasty. Click thumbnail to read full article. 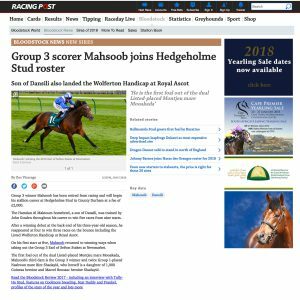 Jan 18: Blood Stock News - Mahsoob retirement to Hedgeholme Stud announcement.